Summer is here for most of us and fresh fruit is available everywhere. Peter just came in with bags of beautiful peaches, aromatic plums and sweet nectarines. These were shipped up from South America but that’s the beauty of a global markets...we can enjoy the harvests year round. 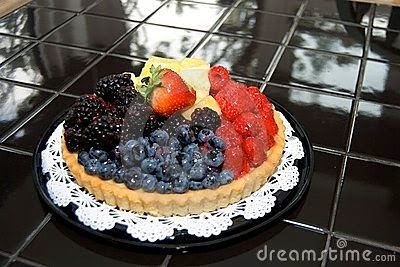 A stunning way to enjoy the bounty of these harvests is in a delicious fruit tart. The main stream grocery stores and commercial bakeries sell their versions for big bucks, but they’re usually very sweet, and often full of artificial ingredients. Those store-baked tarts are often made with a cheap, lard-laden crust, they often contain a gooey pastry cream under the fruit, and the fruit itself has been drenched in some sort of heavy syrup. They are stunning to look at but maybe not the healthiest dessert around. Our way is to make a delicious yeasty shell and just fill it with sliced fruit – nothing more and nothing less. Pure and simple. Fresh and delicious. All natural and better for you. It’s the way to go! To prepare the shell, combine the yeast with milk and 1 tablespoon of sugar. Let stand for 5 minutes. Mix in ½ cup of flour and place the mixture in 150°F oven until it doubles in size. Cream the butter and the remaining sugar until pale and creamy. Add the egg yolks and vanilla, and beat for 5 minutes. Add in the yeast mixture. Add in the remaining flour in small portions, while beating. Beat for 5 more minutes. Whip the egg whites and salt until stiff. Fold into the dough. Butter (or use baking spray) a 9 inch x 12 inch baking pan and sprinkle with the bread crumbs. Spread the dough evenly in the prepared pan and cover with a light cloth or dish towel; place in 150°F oven until the dough doubles in size. Distribute all the fruit slices evenly on top of the dough. Bake at 350°F for 30 minutes. Let cool. Cut into serving portions while still in the pan. Sprinkle with powdered sugar just before serving. 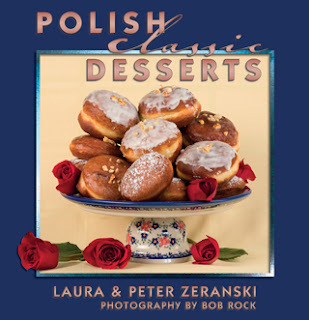 PS We have plenty of outstanding fruit-based desserts that aren’t so sweet, in our Polish Classic Desserts book. For a personally dedicated and autographed copy, just click on the blue book cover at the top of this page.